Then I looked, and there before me was the Lamb, standing on Mount Zion, and with him 144,000 who had his name and his Father's name written on their foreheads. And I heard a sound from heaven like the roar of rushing waters and like a loud peal of thunder. The sound I heard was like that of harpists playing their harps. And they sang a new song before the throne and before the four living creatures and the elders. No one could learn the song except the 144,000 who had been redeemed from the earth. These are those who did not defile themselves with women, for they kept themselves pure. They follow the Lamb wherever he goes. They were purchased from among men and offered as firstfruits to God and the Lamb. No lie was found in their mouths; they are blameless. Then I saw another angel flying in midair, and he had the eternal gospel to proclaim to those who live on the earth--to every nation, tribe, language and people. 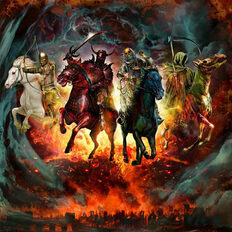 He said in a loud voice, "Fear God and give him glory, because the hour of his judgment has come. Worship him who made the heavens, the earth, the sea and the springs of water." A second angel followed and said, "Fallen! Fallen is Babylon the Great, which made all the nations drink the maddening wine of her adulteries." A third angel followed them and said in a loud voice: "If anyone worships the beast and his image and receives his mark on the forehead or on the hand, he, too, will drink of the wine of God's fury, which has been poured full strength into the cup of his wrath. He will be tormented with burning sulfur in the presence of the holy angels and of the Lamb. And the smoke of their torment rises for ever and ever. There is no rest day or night for those who worship the beast and his image, or for anyone who receives the mark of his name." This calls for patient endurance on the part of the saints who obey God's commandments and remain faithful to Jesus. Then I heard a voice from heaven say, "Write: Blessed are the dead who die in the Lord from now on." "Yes," says the Spirit, "they will rest from their labor, for their deeds will follow them." I looked, and there before me was a white cloud, and seated on the cloud was one "like a son of man" with a crown of gold on his head and a sharp sickle in his hand. Then another angel came out of the temple and called in a loud voice to him who was sitting on the cloud, "Take your sickle and reap, because the time to reap has come, for the harvest of the earth is ripe." So he who was seated on the cloud swung his sickle over the earth, and the earth was harvested. Another angel came out of the temple in heaven, and he too had a sharp sickle. Still another angel, who had charge of the fire, came from the altar and called in a loud voice to him who had the sharp sickle, "Take your sharp sickle and gather the clusters of grapes from the earth's vine, because its grapes are ripe." The angel swung his sickle on the earth, gathered its grapes and threw them into the great winepress of God's wrath. They were trampled in the winepress outside the city, and blood flowed out of the press, rising as high as the horses' bridles for a distance of 1,600 stadia. The Preterists view of who the 144,000 are is detailed in the commentary on chapter 7. The new song being sung is felt to be a song of redemption. Not defiling themselves with women is seen as not joining in with apostate Israel in rejecting Christ and the New Covenant. The angel proclaiming the everlasting gospel is seen as representing the Church taking the gospel to the world as Christ said would occur before the end would come. The end is viewed not as the end of the world or of time but as the end of the Old Covenant age. Some Preterists see this angels proclamation as pertaining specifically to the about to occur judgement upon Israel. Most Preterists view Babylon as Jerusalem which is representative of apostate Israel. This will be elucidated in the commentary on Chapter 17. Judgement is seen as coming upon all those who cooperate with the beast (Rome) in persecuting the Christians. The Christians are encouraged to endure and are looked upon as blessed for their patience even unto death. The first angel is seen as calling on Christ to reap the harvest of believers. Some Preterists associate this with the escape of Jerusalem Christians to Pella before the Roman invasion of Jerusalem. Other Preterists see this as representative of all those converted to Christianity before the judgement upon Israel. The second angel swinging his sickle is seen as God’s judgement being poured upon Israel through the destruction brought by the Roman armies. The Futurist position on the 144,000 is elucidated in the commentary on Chapter 7. Not defiling themselves with women is viewed as Christians avoiding the corruptions of this world. The term “everlasting gospel” is somewhat problematic for Futurists because some Futurists believe there are two gospels (gospel of the Kingdom and the gospel of grace) taught in scripture while others feel only one gospel is taught. Most Futurist expositors, however, see the gospel proclaimed by the angel as representative of both the Kingdom and grace and as a general summons to repent. Futurists view Babylon as representing the religious/political system of the ancient city by that name. Some Futurists see it as an actual rebuilt city of Babylon while most see it as symbolic of a resurrected Roman Empire that will bring judgement upon modern day Israel and be a major player in end time events still future to us. Futurists are divided as to whether the two sickle events represent two separate actions as the Preterists believe or whether both sickles pertain to judgement. Some Futurists associate the vineyard and winepress with Israel as do Preterists while others see these symbols as God’s judgement upon mankind in general. Some Futurists see the so called war of Armageddon coming into view here because of the degree of carnage described. The reference to outside the city is felt to relate to outside the walls of Jerusalem and the approximate territory of the country of Israel. Blood running to the horse’s bridles is seen as figurative of the severity of events. I saw in heaven another great and marvelous sign: seven angels with the seven last plagues--last, because with them God's wrath is completed. And I saw what looked like a sea of glass mixed with fire and, standing beside the sea, those who had been victorious over the beast and his image and over the number of his name. They held harps given them by God and sang the song of Moses the servant of God and the song of the Lamb: "Great and marvelous are your deeds, Lord God Almighty. Just and true are your ways, King of the ages. Who will not fear you, O Lord, and bring glory to your name? For you alone are holy. All nations will come and worship before you, for your righteous acts have been revealed." After this I looked and in heaven the temple, that is, the tabernacle of the Testimony, was opened. Out of the temple came the seven angels with the seven plagues. They were dressed in clean, shining linen and wore golden sashes around their chests. Then one of the four living creatures gave to the seven angels seven golden bowls filled with the wrath of God, who lives for ever and ever. And the temple was filled with smoke from the glory of God and from his power, and no one could enter the temple until the seven plagues of the seven angels were completed. Preterists see the time frame for the seven last plagues as the overall period of upheaval in the Roman Empire and judgement upon Israel leading to the destruction of the temple and the city of Jerusalem. Singing the song of Moses is viewed as the saints rejoicing in the same manner as Israel did when leaving Egypt. Now Egypt had come to represent apostate Israel (Revelation 11:8). Singing the song of the Lamb is seen as rejoicing in the deliverance found in Christ. No one being able to enter the temple until after the plagues are complete is viewed as entering the spiritual temple of eternal life once the earthly temple representing the Old Covenant of death is destroyed. The seven angels are seen as coming out of a heavenly temple. The sea of glass mingled with fire is seen as representing God’s wrath. Those standing by the sea of glass are viewed as those martyred during the tribulation as other Christians would have been raptured prior to the tribulation according to the dispensationalist view. Singing of the songs is seen in much the same way as the Preterist view. Then I heard a loud voice from the temple saying to the seven angels, "Go, pour out the seven bowls of God's wrath on the earth." The first angel went and poured out his bowl on the land, and ugly and painful sores broke out on the people who had the mark of the beast and worshiped his image. The second angel poured out his bowl on the sea, and it turned into blood like that of a dead man, and every living thing in the sea died. The third angel poured out his bowl on the rivers and springs of water, and they became blood. Then I heard the angel in charge of the waters say: "You are just in these judgments, you who are and who were, the Holy One, because you have so judged; for they have shed the blood of your saints and prophets, and you have given them blood to drink as they deserve." And I heard the altar respond: "Yes, Lord God Almighty, true and just are your judgments." The fourth angel poured out his bowl on the sun, and the sun was given power to scorch people with fire. They were seared by the intense heat and they cursed the name of God, who had control over these plagues, but they refused to repent and glorify him. The fifth angel poured out his bowl on the throne of the beast, and his kingdom was plunged into darkness. Men gnawed their tongues in agony and cursed the God of heaven because of their pains and their sores, but they refused to repent of what they had done. The sixth angel poured out his bowl on the great river Euphrates, and its water was dried up to prepare the way for the kings from the East. Then I saw three evil spirits that looked like frogs; they came out of the mouth of the dragon, out of the mouth of the beast and out of the mouth of the false prophet. They are spirits of demons performing miraculous signs, and they go out to the kings of the whole world, to gather them for the battle on the great day of God Almighty. "Behold, I come like a thief! Blessed is he who stays awake and keeps his clothes with him, so that he may not go naked and be shamefully exposed." Then they gathered the kings together to the place that in Hebrew is called Armageddon. The seventh angel poured out his bowl into the air, and out of the temple came a loud voice from the throne, saying, "It is done!" Then there came flashes of lightning, rumblings, peals of thunder and a severe earthquake. No earthquake like it has ever occurred since man has been on earth, so tremendous was the quake. The great city split into three parts, and the cities of the nations collapsed. God remembered Babylon the Great and gave her the cup filled with the wine of the fury of his wrath. Every island fled away and the mountains could not be found. From the sky huge hailstones of about a hundred pounds each fell upon men. And they cursed God on account of the plague of hail, because the plague was so terrible. Futurists believe these seven last plagues are yet future to us and will be God’s judgement upon the world just prior to the return of Christ to begin a thousand year millennial reign. Futurists are divided as to giving a literal or a symbolic hermeneutic to these plagues. Those taking a literal approach are further divided as to whether these plagues are directly inflicted by God or inflicted through human warfare. For example, the sores of the first plague could be directly inflicted by God or be the result of chemical warfare or radioactive nuclear fallout. Literalists point to the plagues that came upon Egypt and see a number of parallels with what is found in the Revelation. Since the plagues upon Egypt are taken as literal occurrences, it is believed the same is true regarding the plagues at the end of the world. Those who hold to the symbolic approach see in the sores a representation of mans moral degenerateness which God allows to occur. Most Futurists mix literal and symbolic interpretations. The drying up of the Euphrates River is seen as literal as it is believed this opens the way for the great armies from the East to descend upon the Middle East which leads to the “Battle of Armageddon.” The apparent announcement by Christ that He is coming as a thief in relation to the impending battle of Armageddon is felt to show correlation between these two events. Armageddon is identified with Mount Megiddo with is located just south of Galilee and forty miles north of Jerusalem. It consists of a raised area overlooking a vast area of flat land. The final plague is seen as bringing a crushing defeat to the kingdoms of this world in anticipation of the coming of Christ. Many Preterists see these seven plagues as the culmination of judgement against Jerusalem which is seen as the Babylon of the Revelation. Other Preterists see some of these plagues being directed against Rome as well. The plagues are seen largely as symbolic of the carnage of war. It is recognized, however, that the suffering experienced in association with these plagues may have been a literal reflection of the plagues description. Some Preterists see in the plagues the literal fulfillment of what Moses said would befall Israel for being unfaithful (See Deuteronomy 28). Matthew 23:34-38: I am sending you prophets and wise men and teachers. Some of them you will kill and crucify; others you will flog in your synagogues and pursue from town to town. And so upon you will come all the righteous blood that has been shed on earth, from the blood of righteous Abel to the blood of Zechariah son of Berekiah, whom you murdered between the temple and the altar. I tell you the truth; all this will come upon this generation. "O Jerusalem, Jerusalem, you who kill the prophets and stone those sent to you, how often I have longed to gather your children together, as a hen gathers her chicks under her wings, but you were not willing. Look, your house is left to you desolate. The plague upon the throne of the beast is seen as judgement against Rome. Rome itself was going through great turmoil at the same time it was destroying Israel. The Euphrates drying up is seen by some as Titus returning with allied armies from the eastern regions of the empire to facilitate the final siege of Jerusalem as Josephus writes of in his histories. Preterists see Armageddon as associated with the land area just to the north of Jerusalem where much slaughter of human life had occurred over thousands of years. It is seen as symbolically representing the final slaughter of the Jews as Jerusalem is taken and the temple destroyed. Christ coming like a thief is seen as a rhetorical statement as to His involvement with this entire period of judgement. The announcement “it is done!” is seen as the termination of the Old Covenant and the full establishment of the New Covenant. It is felt this is further signified by the great earthquake which is viewed as symbolically showing this change in Covenants as foreseen by the writer to the Hebrews. This writer associates the shaking of the earth at the giving of the Old Covenant with a greater shaking of the earth at the time the New Covenant is established (Hebrews 12). The dividing of the city into three parts is seen as symbolizing Israel's three part judgement of being burned in the city, slain with the sword and taken captive. Some Preterists see it as reflective of the three warring factions in the city of Jerusalem that had largely devastated the city before the Romans came in. The hail stones each weighing 100 pounds could pertain to the Roman catapults which were stone throwing engines of war. Josephus records these stones as weighing 100 pounds. One of the seven angels who had the seven bowls came and said to me, "Come, I will show you the punishment of the great prostitute, who sits on many waters. With her the kings of the earth committed adultery and the inhabitants of the earth were intoxicated with the wine of her adulteries." Then the angel carried me away in the Spirit into a desert. There I saw a woman sitting on a scarlet beast that was covered with blasphemous names and had seven heads and ten horns. The woman was dressed in purple and scarlet, and was glittering with gold, precious stones and pearls. She held a golden cup in her hand, filled with abominable things and the filth of her adulteries. This title was written on her forehead: MYSTERY BABYLON THE GREAT THE MOTHER OF PROSTITUTES AND OF THE ABOMINATIONS OF THE EARTH. I saw that the woman was drunk with the blood of the saints, the blood of those who bore testimony to Jesus. When I saw her, I was greatly astonished. "This calls for a mind with wisdom. The seven heads are seven hills on which the woman sits. They are also seven kings. Five have fallen, one is, the other has not yet come; but when he does come, he must remain for a little while. The beast who once was, and now is not, is an eighth king. He belongs to the seven and is going to his destruction. "The ten horns you saw are ten kings who have not yet received a kingdom, but who for one hour will receive authority as kings along with the beast. They have one purpose and will give their power and authority to the beast. They will make war against the Lamb, but the Lamb will overcome them because he is Lord of lords and King of kings--and with him will be his called, chosen and faithful followers." Then the angel said to me, "The waters you saw, where the prostitute sits, are peoples, multitudes, nations and languages. The beast and the ten horns you saw will hate the prostitute. They will bring her to ruin and leave her naked; they will eat her flesh and burn her with fire. For God has put it into their hearts to accomplish his purpose by agreeing to give the beast their power to rule, until God's words are fulfilled. The woman you saw is the great city that rules over the kings of the earth." Futurists see chapter 17 as a parenthetical look at events that occur prior to the pouring out of the bowls of chapter 16. Babylon is seen as a political/religious entity that will rise up at the time of the end and initially be in alliance with the beast power which is seen as a revived Roman Empire. Some futurists see Babylon as a literal rebuilt city of Babylon. Because the woman is described as dressed in purple and scarlet, and glittering with gold, precious stones and pearls, some protestant interpreters see the Roman Catholic Church as the woman. Reference to prostitutes being children of this woman is felt to represent all of apostate Christianity. Reference to Babylon being drunk with the blood of the saints is viewed as this false religious system persecuting true Christians. Some view Babylon as representing all false religion from the beginning of the world. The woman seen as riding the beast is viewed as this false religious system working in close association with the beast power. The reference to seven hills upon which the women sits is felt by some to be a clear allusion to Rome as Rome from ancient times was called “the city on seven hills.” Other futurists take the historicist approach and view the seven hills as representing the five empires of Egypt, Assyria, Babylon, Medo-Persia and Greece with Rome being the sixth as seen by John. The seventh is seen as yet to come. Most Futurists equate the ten horns of Revelation 17 with the ten toes of Daniels image in Daniel 2 and the ten horns of Daniel’s fourth beast in Daniel 7. Preterists see Revelation 17 as an overview of the dynamics surrounding the identity of the beast and Babylon. The beast is seen as representing the Roman Empire at the time John wrote and parallels the beast of Revelation 13, the dynamics of which were covered in commentary on chapter 13. Some Preterists see the woman as representing the city of Rome during the reign of Nero because it was during his reign many saints were killed. This is seen as reflecting the statement about the woman being drunk with the blood of the saints and martyrs. Most Preterists, however, see the woman as representing Jerusalem and therefore the Babylon of the Revelation. Preterists point out that John is seeing things that are said to shortly come to pass. Rome didn’t fall for another 400 years. Therefore Rome could not be Babylon. In Revelation 11:8, “the great city, which is figuratively called Sodom and Egypt,” is identified with the place where Christ was crucified which we know was the area of Jerusalem. Jerusalem is therefore identified as the “great city.” Jerusalem is characterized as Sodom and Egypt, both symbols of sin and corruption. This is seen to harmonize well with the description of Babylon. Babylon is called the “great city,” in Revelation 17:18, 16:19 and several times in chapter 19. In Revelation 17:6 and 18:24 it’s recorded that in Babylon was found the blood of prophets and of the saints. In Matthew 23:37: Christ said “O Jerusalem, Jerusalem, you who kill the prophets and stone those sent to you.” This chapter shows Christ promising judgement upon those He was addressing for all the righteous blood shed throughout Israel’s history and concludes by alluding to the destruction of the temple. The woman described in Revelation 17 is adorned with precious stones and pearls. She is then identified as being adulterous and a prostitute. In Ezekiel chapter 16, we find an allegory about Jerusalem. Here the writer shows how Jerusalem was adorned with gold and silver and fine clothes and then squandered it all to become a prostitute and enter into adulterous relationships with other nations. The writer goes on to show how Jerusalem would be stripped of her wealth and beauty and the very ones she committed adultery with would turn on her. Jerusalem and the nation of Israel are identified as prostitutes and harlots many times in Scripture. In Mark 8:38, Christ refers to those He was speaking to as an adulterous generation. Preterists see the waters where the prostitute sets as representing the many nations where the Jewish religious system was extant in the first century. The first century historian Philo writes that the Jewish people were diffused throughout every continent and over every island. The Roman historian Tacitus shows much destruction of Jewish society occurred throughout the Empire just prior to the destruction of Jerusalem. He writes that the entire Jewish population of Caesarea was massacred in one day. Similar atrocities happened in Scythopolis, Ascalon, Ptolemais, Tyre and other cities of the Empire. Tacitus writes that in Alexandria the whole Jewish quarter was deluged with blood and fifty thousand corpses lay in the streets. Preterists believe this all points to a great judgement upon first century Israel which culminated in the destruction of Jerusalem which was Israel’s seat of Government and the designated Babylon of the Revelation. After this I saw another angel coming down from heaven. He had great authority, and the earth was illuminated by his splendor. With a mighty voice he shouted: "Fallen! Fallen is Babylon the Great! She has become a home for demons and a haunt for every evil spirit, a haunt for every unclean and detestable bird. For all the nations have drunk the maddening wine of her adulteries. The kings of the earth committed adultery with her, and the merchants of the earth grew rich from her excessive luxuries." Then I heard another voice from heaven say: "Come out of her, my people, so that you will not share in her sins, so that you will not receive any of her plagues; for her sins are piled up to heaven, and God has remembered her crimes. Give back to her as she has given; pay her back double for what she has done. Mix her a double portion from her own cup. Give her as much torture and grief as the glory and luxury she gave herself. In her heart she boasts, `I sit as queen; I am not a widow, and I will never mourn.' Therefore in one day her plagues will overtake her: death, mourning and famine. She will be consumed by fire, for mighty is the Lord God who judges her. "When the kings of the earth who committed adultery with her and shared her luxury see the smoke of her burning, they will weep and mourn over her. Terrified at her torment, they will stand far off and cry: "`Woe! Woe, O great city, O Babylon, city of power! In one hour your doom has come!' "The merchants of the earth will weep and mourn over her because no one buys their cargoes any more-- cargoes of gold, silver, precious stones and pearls; fine linen, purple, silk and scarlet cloth; every sort of citron wood, and articles of every kind made of ivory, costly wood, bronze, iron and marble; cargoes of cinnamon and spice, of incense, myrrh and frankincense, of wine and olive oil, of fine flour and wheat; cattle and sheep; horses and carriages; and bodies and souls of men. "They will say, `The fruit you longed for is gone from you. All your riches and splendor have vanished, never to be recovered.' The merchants who sold these things and gained their wealth from her will stand far off, terrified at her torment. They will weep and mourn and cry out: "`Woe! Woe, O great city, dressed in fine linen, purple and scarlet, and glittering with gold, precious stones and pearls! In one hour such great wealth has been brought to ruin!' "Every sea captain, and all who travel by ship, the sailors, and all who earn their living from the sea, will stand far off. When they see the smoke of her burning, they will exclaim, `Was there ever a city like this great city?' They will throw dust on their heads, and with weeping and mourning cry out: "`Woe! Woe, O great city, where all who had ships on the sea became rich through her wealth! In one hour she has been brought to ruin! Rejoice over her, O heaven! Rejoice, saints and apostles and prophets! God has judged her for the way she treated you.'" Then a mighty angel picked up a boulder the size of a large millstone and threw it into the sea, and said: "With such violence the great city of Babylon will be thrown down, never to be found again. The music of harpists and musicians, flute players and trumpeters, will never be heard in you again. No workman of any trade will ever be found in you again. The sound of a millstone will never be heard in you again. The light of a lamp will never shine in you again. The voice of bridegroom and bride will never be heard in you again. Your merchants were the world's great men. By your magic spell all the nations were led astray. In her was found the blood of prophets and of the saints, and of all who have been killed on the earth." Some Preterists feel the descriptions of the commerce of Babylon are more apropos to Rome than to Jerusalem. Other Preterists point out that history shows Jerusalem to be a rich commercial center in the first century as she sat at the crossroads of several continents. A great deal of trade passed through Jerusalem and the land of Israel in general. The various Jewish festivals drew Jews and converts to Judaism from all over the Roman Empire as Acts 2:9-10 indicates. The magnificence of the temple was a virtual tourist attraction. When Jerusalem and much of the land of Israel was destroyed it was a big loss to the merchants of the Empire. Descriptions of the “great city, dressed in fine linen, purple and scarlet, and glittering with gold, precious stones and pearls” is again seen as reflective of Ezekiel’s description of Jerusalem. The chapter ends with seeing this city as responsible for the blood of prophets and of the saints, and of all who have been killed on the earth." This is seen to clearly parallel what Christ said to the religious leaders in Jerusalem as recorded in Matthew 23;34-38. Some Futurists see the description of Babylon in Revelation 18 as a literal rebuilt city of Babylon in Iraq. Futurists who expect an actual rebuilding of Babylon refer to Jeremiah 50 and 51 where the prophet laments over the city of Babylon. It is felt that these prophecies were never historically fulfilled in the destruction of ancient Babylon. Other Futurists see Babylon as representative of a “resurrected Roman Empire that will be in alliance with the leadership of an apostate church often seen as the Roman Catholic Church. It is believed that this apostate church in alliance with the beast power will persecute and put to death anyone who does not adhere to its rule. Some Futurists believe this revived Empire will be headed by Germany and be composed of ten European nations representing the seventh head and ten horns of Revelation 17, the seventh horn of Revelation 13 and the ten toes of Daniel’s image in Daniel 2. It is felt this juggernaut will attack Israel and then be attacked by a huge armed force from the Eastern countries of China and Russia which will be the war of Armageddon. Christ will return at this point and defeat all forces and begin His Millennial rule. Lament over the fall of Babylon will be great as the world realizes the wealth and power of this great Empire has been destroyed.